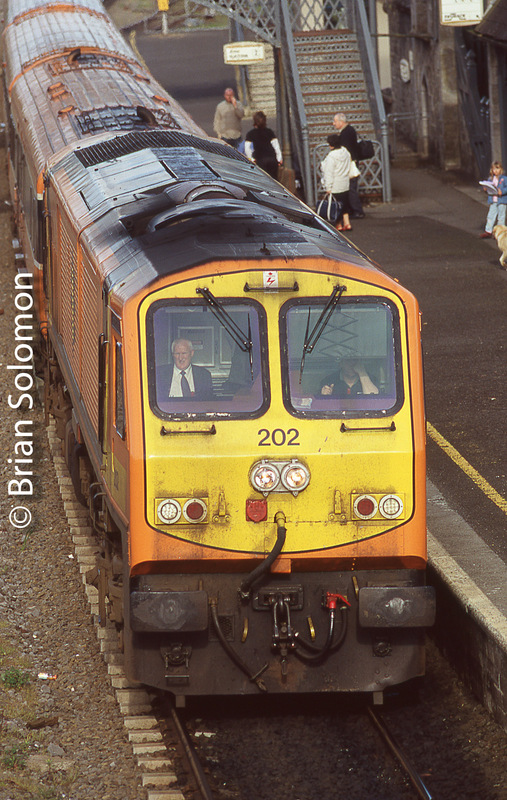 Irish Rail 211, I Never Went Out for it, but here it is! 4 Views. Ok, I’ll be honest. Irish Rail 211 seemed like part of the furniture. Just a common 201 class diesel. I didn’t make any special effort to put it on film. Yet, whenever it passed, hauling freight or passenger, I made photos of it. It’s hard to believe that its been nearly 10 years since I last saw 211 on the move. Yet, when I look at these photos, the scenes tell all. So much has changed in the interval. 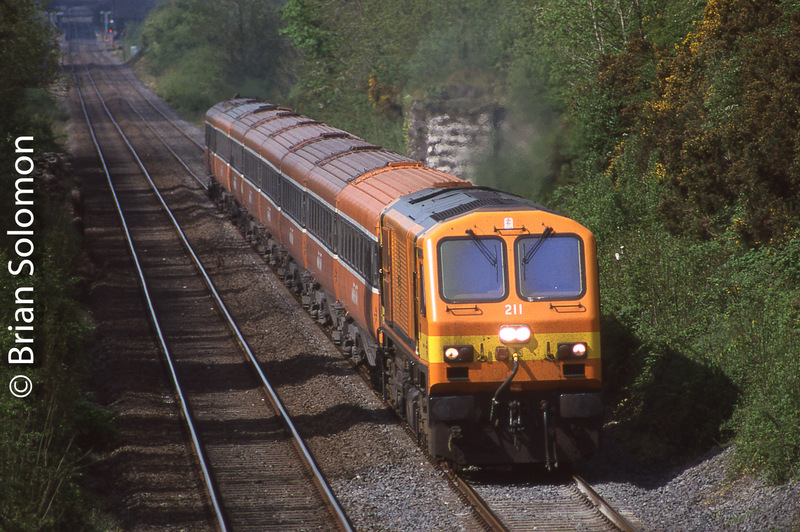 400mm Telephoto view from the top of Ballybrophy bank on 13 May 2000 with an up-road train from Cork to Dublin. 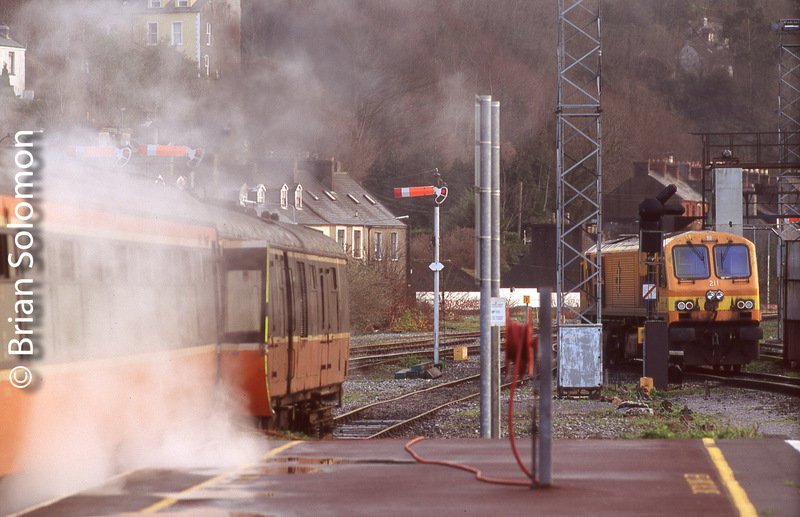 Kent Station Cork on 10 January 2005. Fujichrome Sensia 100 exposed with a Nikon F3 with 180mm lens. 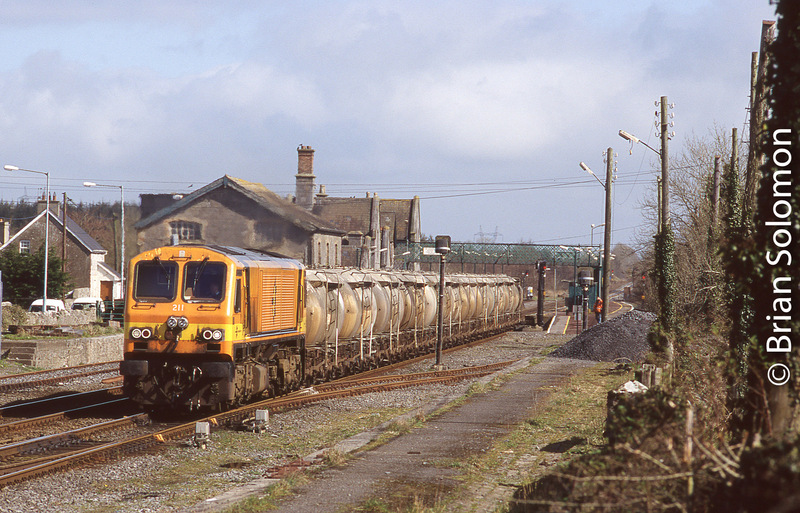 A down road bubble cement train heading to Cork passes Ballybrophy on 25 March 2005. Exposed with a Nikon on Fujichrome Sensia 100. Irish Rail 211 in the revised orange and yellow livery as photographed at Islandbridge Junction in Dublin on 10 December 2007. Canon EOS-3 with 50mm lens. Note the Bo-Bo towing a failed Enterprise 201. 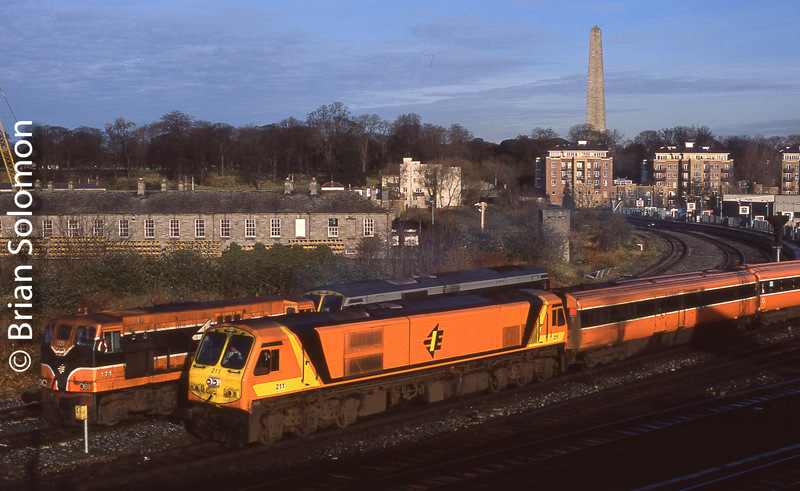 Class 201 Retrospective: Irish Rail 205 on the Move. To mark my twenty years photographing Irish Railways, I’m posting images of each of Irish Rail’s 201-class General Motors diesels in numerical order. A dozen years ago, I wouldn’t have found anything noteworthy in my photos of Irish Rail 205 at work. But that’s part of the point of this exercise. You never know which photos will become interesting over time. The common becomes unusual; the normal become curious; the routine will seem exciting. 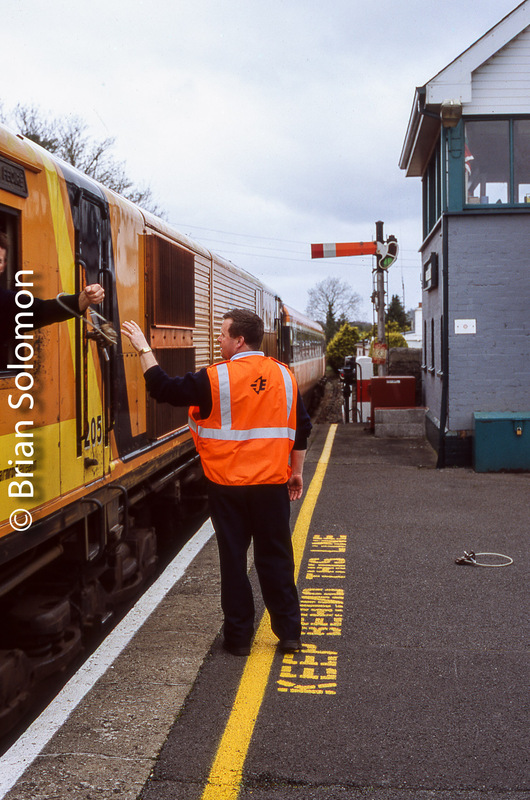 Irish Rail’s signalman at Castlerea hands the staff to the driver of engine 205 as it passes the cabin on its way up to Dublin on 9 April 2005. Irish Rail 205 crests Ballybrophy bank on 3 June 2006 on its way to Cork from Dublin. Exposed on Fujichrome using a Contax G2 rangefinder with Zeiss 28mm Biogon lens. Also See: Irish Rail 202! Hooray! Some locomotives were common; I must have a hundred photos of class leader 201 on the roll (featured in the first 201 Retrospective installment). And every time I turned around, I seem to find 215 leading a train. Of the 35 201s, I found that engine 202 was by far the most elusive. Several years ago, I scoured my files and located just 3 colour slides of 202. A subsequent review of black & white negatives turned up another image (displayed in my October 2017 post, linked above). I knew there must be more. 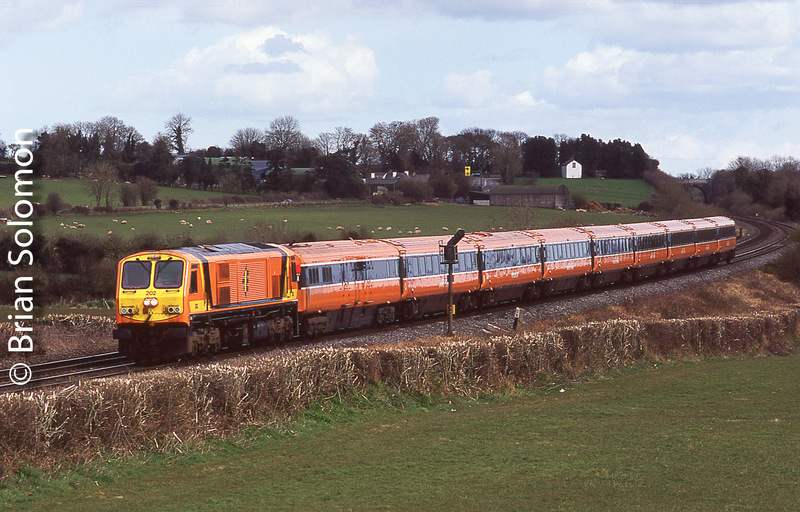 Irish Rail 202 was among the 201s to receive the improved orange and black livery with bright yellow ends. I simply had to have made photos of it in that livery! So, as I was trolling through hundreds of boxes of slides over the last few months, I kept an eye open and lo and behold! I found several more images of the elusive locomotive. My questions are: why was 202 so elusive? Was it simply luck of the draw that I rarely saw it on the move? Was 202 hiding somewhere? Was it especially unreliable and spent most of the time at Inchicore awaiting repair? You might wonder why I didn’t find these photos sooner. The answer has several considerations; at the time of exposure the photos didn’t make my final cut. While there’s nothing horribly wrong with these photos, there’s minor technical flaws that resulted in me discounting them. Also, the significance of these images wasn’t evident to me at the time of exposure and so remained in the little green boxes and hadn’t been transferred to my preferred files. Lastly, I don’t organize my slides by locomotive number, so finding a specific engine photo can be challenging. 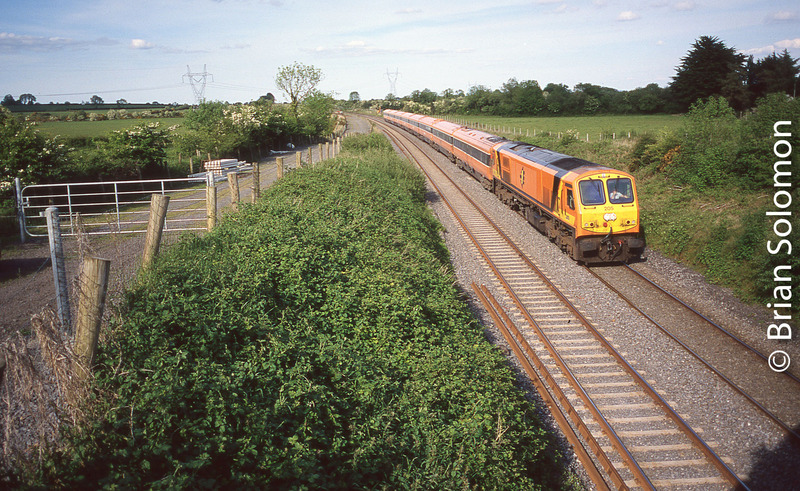 On 5 May 2006, I made this view of Irish Rail 202 at Portarlington. If you look carefully, you’ll notice that the photo isn’t level. That was the initial reason I rejected it. Easy enough to fix digitally now, but a no-go for the slide show! The point of this exercise is that sometimes the content of a photo becomes more interesting as time passes. The photo of a fairly ordinary locomotive at work has greater interest after that engine is withdrawn from traffic. So what’s wrong with this photo. A 201 with Mark3s at Cherryville, at the time it couldn’t get any more common than that! As a result this slide stayed in the box for almost 12 years. Now, I’m really glad I made the picture!